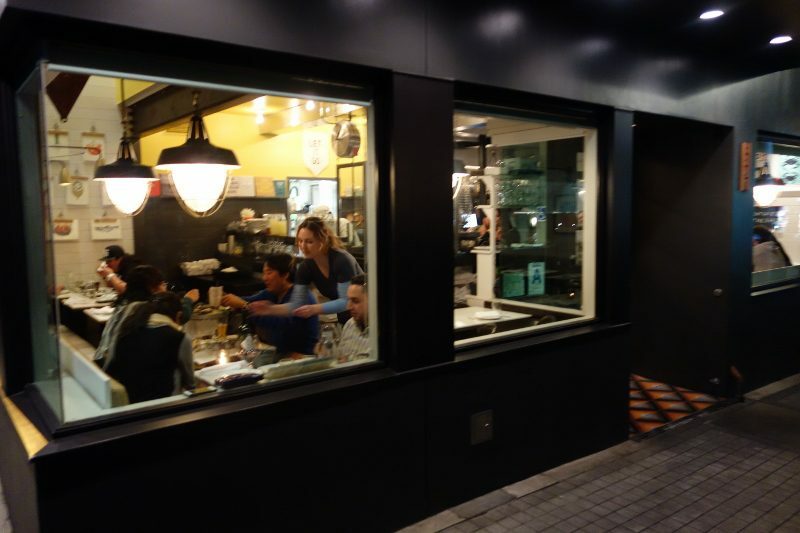 The menu is a blend of traditional and innovative. 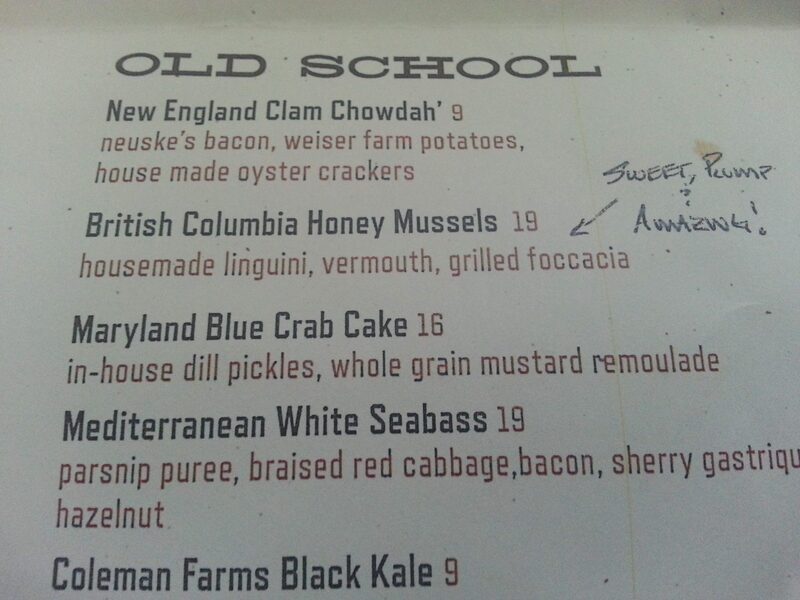 At the top is the Raw Bar Menu and then it is divided into “Old School” (with items like New England Clam Chowdah and Maryland Blue Crab Cake) and “New School” (including dishes with Asian and Mediterranean influences). 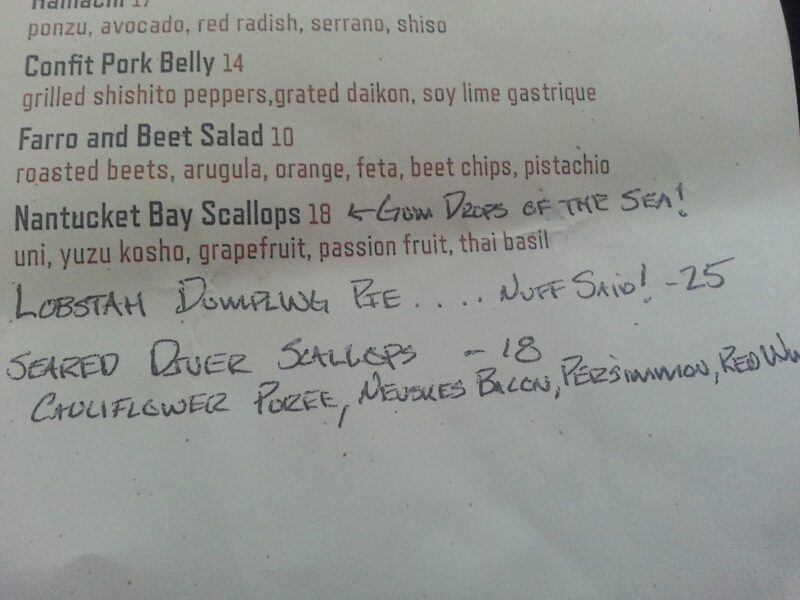 The menu also includes handwritten seasonal additions, along with fun thoughts from the kitchen…serious food in an unpretentious, down-to-earth manner. 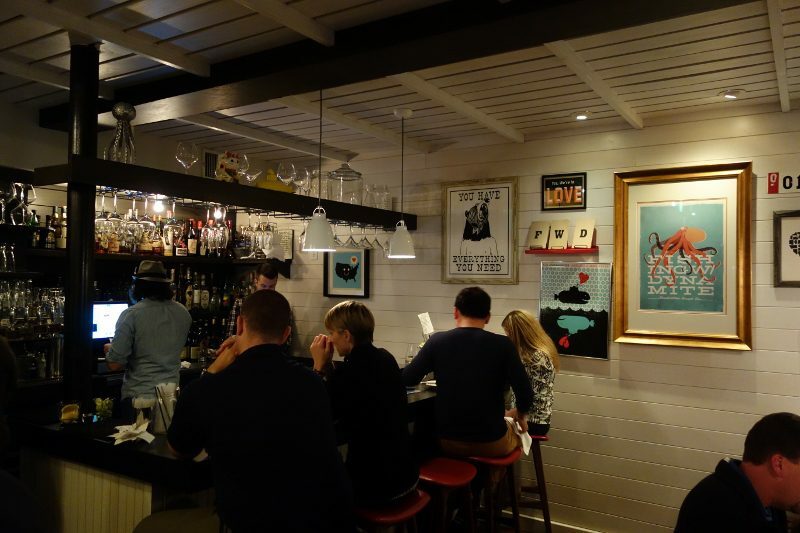 From the Raw Bar, we had Jumbo Shrimp with lime juice, olive oil and dill, served with a white mustard remoulade and a cocktails sauce and Peruvian Scallops with citrus pesto and red grapefruit. 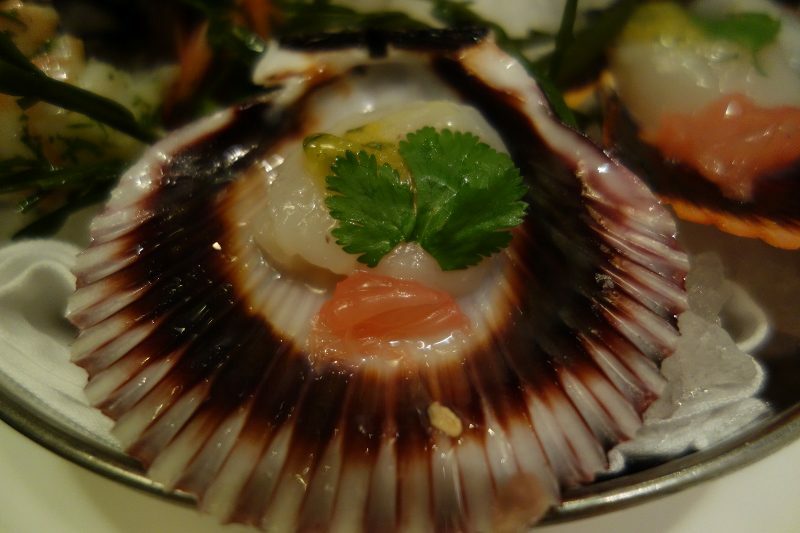 The Peruvian Scallop was tender, fresh, light and melted in the mouth. Extraordinary! While the classic Manhattan Clam Chowder is always on the menu, for the month of February, Chef Lefevre offered a special clam chowder each Tuesday. 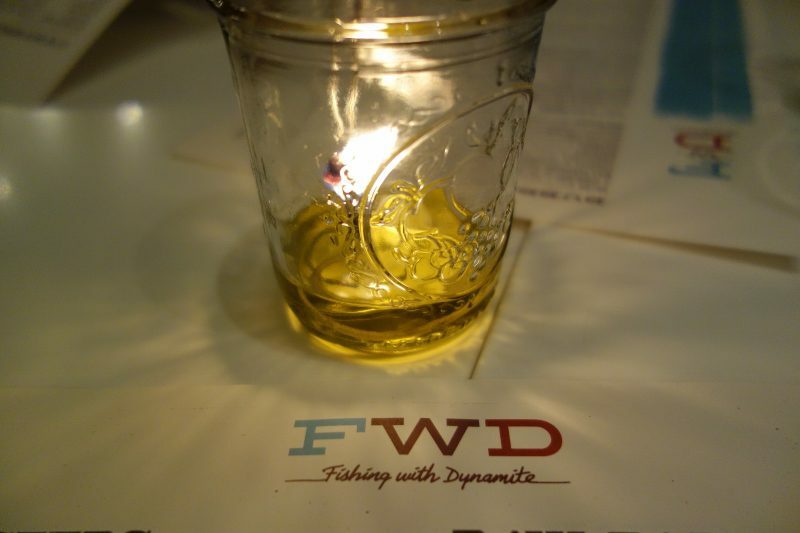 The first week was Oyster Chard and Pancetta Chowder, the second week was Corn, Leek and Smoked Potato Chowder and the final week was Grilled Tomato Manhattan Clam Chowder. 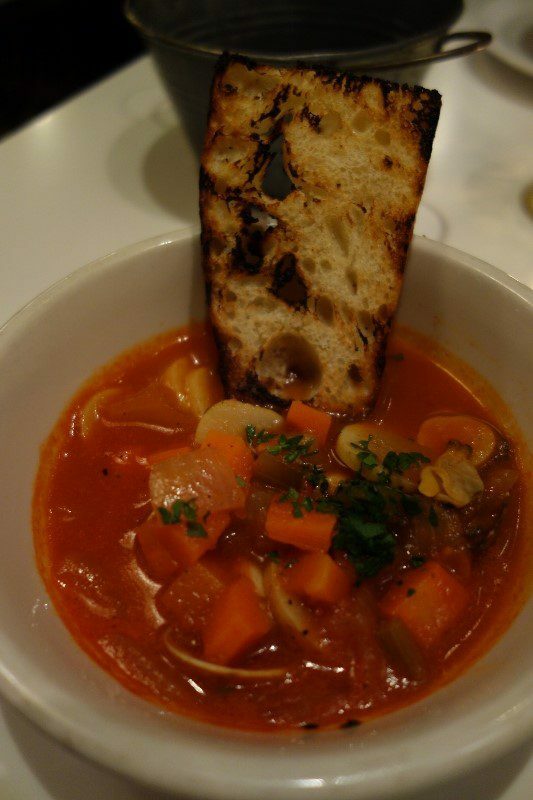 The Grilled Tomato Manhattan Clam Chowder was filled with clams, potatoes, carrots and bacon fat. There was a smokiness to it and a little heat but it was also light and full of flavor. 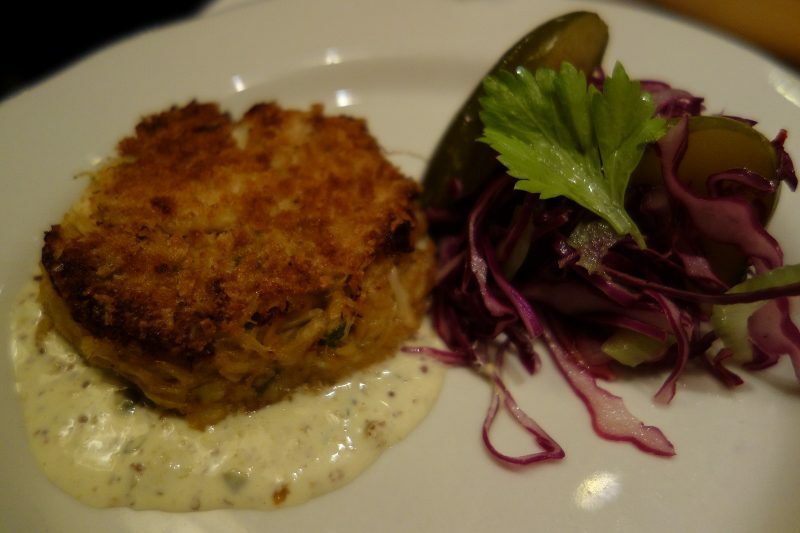 Maryland Blue Crab Cake with in-house dill pickles, whole grain mustard remoulade ($16) – when a crab cake is 95+% crab and -5% cake, it’s a good thing! 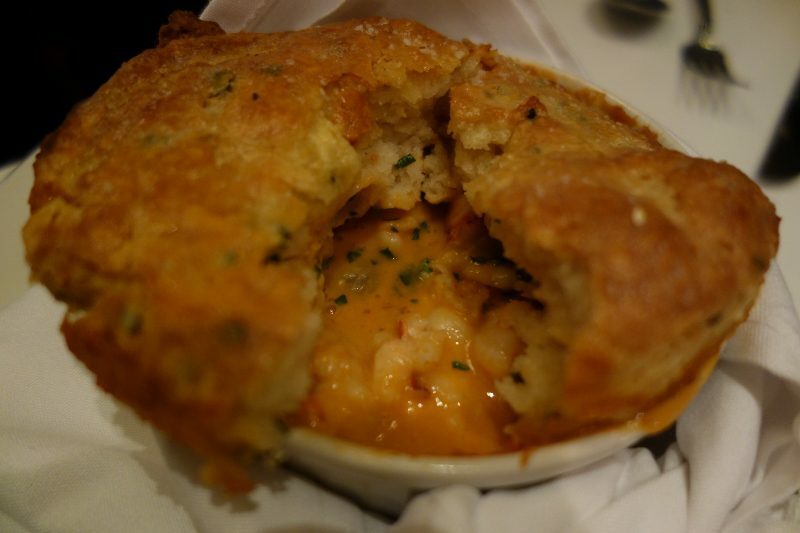 Lobstah Dumpling Pie ($25) – The menu said “Nuff Said!” and I have to agree. 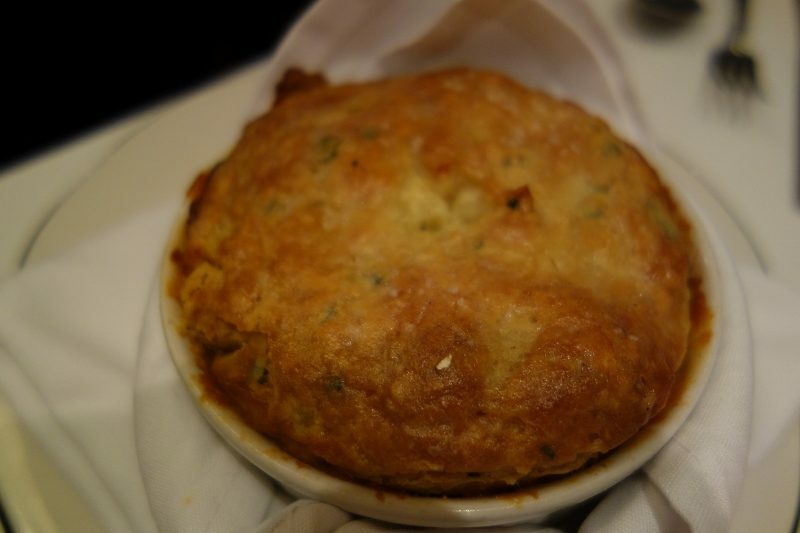 The cornbread on top of a sea of lobster was my favorite. 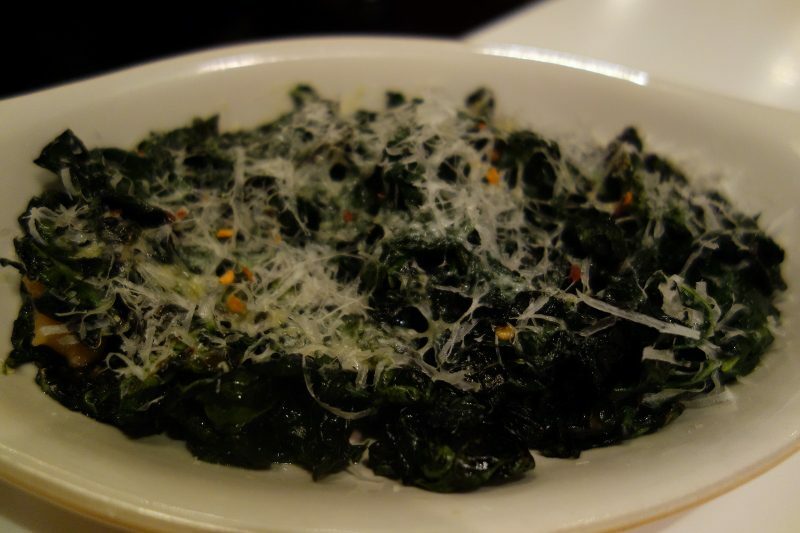 Coleman Farms Black Kale with Parmesan cheese, chili flakes, lemon ($9) added a little green to the meal. 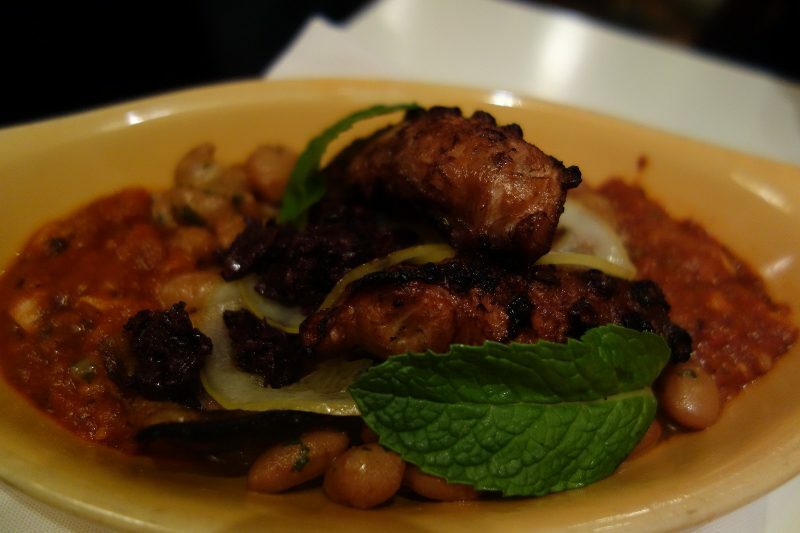 Grilled Octopus with cranberry bean, date-tomato ragu, preserved lemon, olive tapenade ($19) was cooked to perfection. It was meaty with the right amount of char on the outside. Be sure to leave room for dessert! 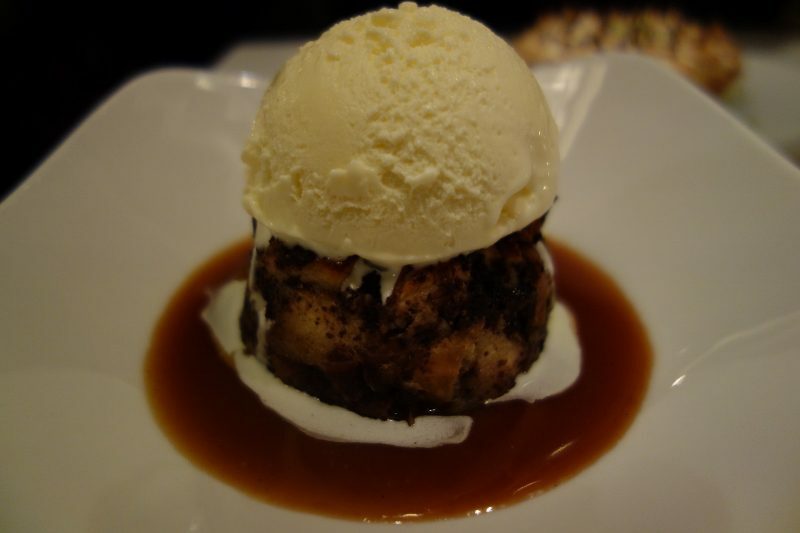 We couldn’t stop eating the Pretzel and Chocolate Bread Pudding made with soft pretzels, dark chocolate, salted caramel sauce and house made ice cream ($9). The saltiness of the soft pretzel and the caramel sauce contrasted nicely with the cool, creamy ice cream. 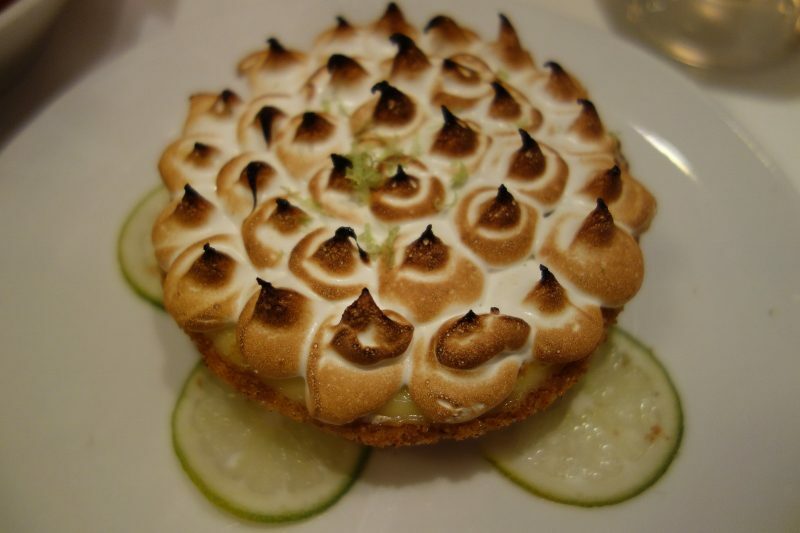 Key Lime Pie with graham cracker crust and kaffir lime meringue ($7) – the perfect amount of tartness in a personalized sized pie, with a surprisingly soft crust. 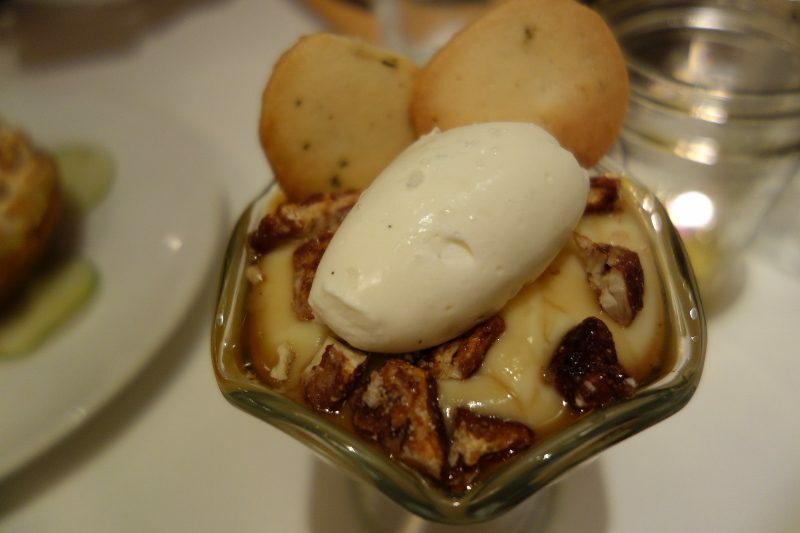 Maple Pudding with Rosemary Sandies, buffalo trace bourbon and candied pecans ($5) – A sugary pudding with some boozy notes and a sweet crunch from the pecans, it was sweet like a pudding pecan pie. 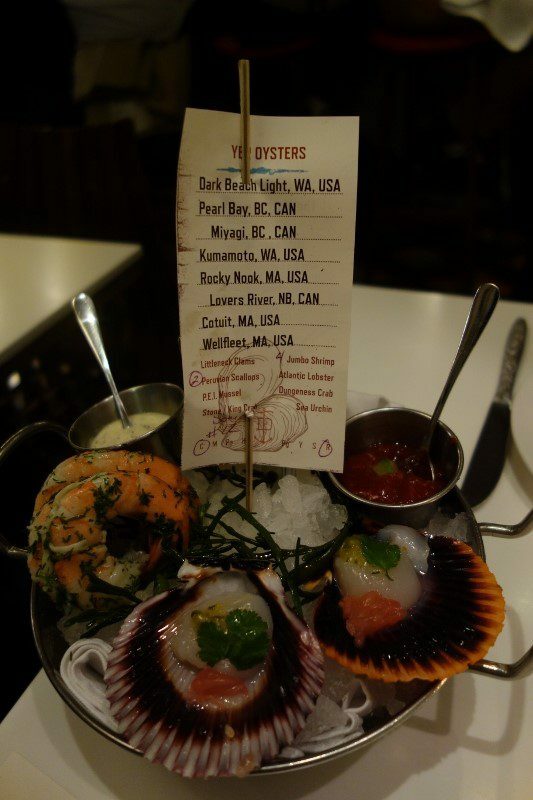 This entry was posted in Food and tagged Coleman Farms Black Kale, David LeFevre, Fishing With Dynamite, Grilled Octopus, Grilled Tomato Manhattan Clam Chowder, Jumbo Shrimp, Key Lime Pie, Lobstah Dumpling Pie, Manhattan Beach, Maple Pudding with Rosemary Sandies, Maryland Blue Crab Cake, Nantucket Bay Scallops, Peruvian Scallops, Pretzel and Chocolate Bread Pudding by Allison Levine.